I continued with the plan I started last week. Gaildorf West is along the bottom edge of the room with the helix down to staging in the lower right corner. The middle of the room has the weg branch line to Untergroeningen on a pensinsula. I very intentionally only included the two end-points of that line to allow for branch line trains to run through some scenery along the way. The main line from Gaildorf West towards Backnang runs through the Kappelestunnel and on a narrow shelf around the room with the town of Murrhardt modeled in the upper right corner. The maximum train length I'm shooting for is 180 cm (5x 26.4m passenger carriages + locomotive), so each station should have at least one siding that fits a maximum length train, and there needs to be at least 5m distance between the first turnouts of neighboring stations to leave space for the appropriate entry signals. 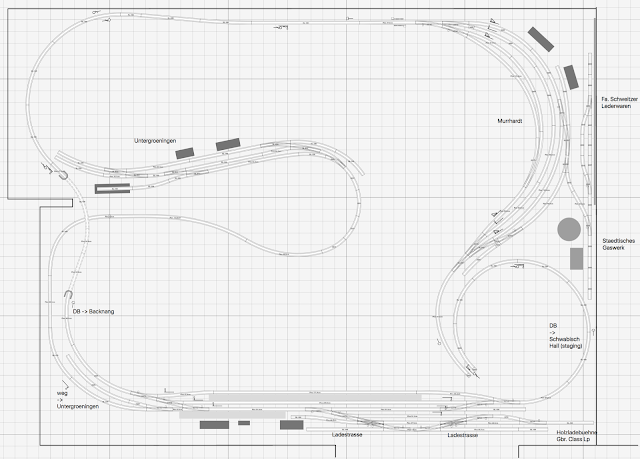 I want to run operations on this layout. Passenger trains and freight trains. Through trains and local trains. Switching jobs and transfer runs. Someone has to run the trains. Fremo-style station agents ("Fahrdienstleiter") control the flow of trains through the stations. I need room for all these people, so aisle space is important and I'm trying to maintain 1m (3 ft) aisle width. I currently have the upper level at 150cm rail-height, and the lower level at 110cm. The room entrance is a duck-under under the Gaildorf West freight yard at 140cm (~55in). That's already a compromise. Fremo modules are set at 130cm rail height and module duck-unders were manageable at module meets I've been to, so I'm hoping that 20cm more headroom works well enough for everybody. The lower level will cross the entrance on a gate or movable bridge. Overall I'm not happy with the arrangement in this plan. Contrary to reality, Murrhardt is set in a curve in order to fit between the wall and the helix. Major industries are Lederfabrik Schweitzer and the city gas works. Because of the curved arrangement, I needed to use several Peco and Roco 2-rail turnouts that require conversion to work with Maerklin rolling stock. Quite some effort, but feasible. Just like Gaildorf West, Murrhardt is very compressed, on top of that mirrored and flipped. The track connection to Schweitzer and the gas works is different, too, but it doesn't matter that much. At this point my version is so different, that it's at most "inspired by Murrhardt", and I'm missing several defining features of the station (e.g. the bridge over the Dentelbach and Siegelsberger Strasse). The helix in the corner works ok for Gaildorf West, but collides badly with Murrhardt. I either need to get rid of the helix or move it somewhere else in the room. Using the peninsula might be an option, but I suspect that will be problematic with Backnang on the lower level. 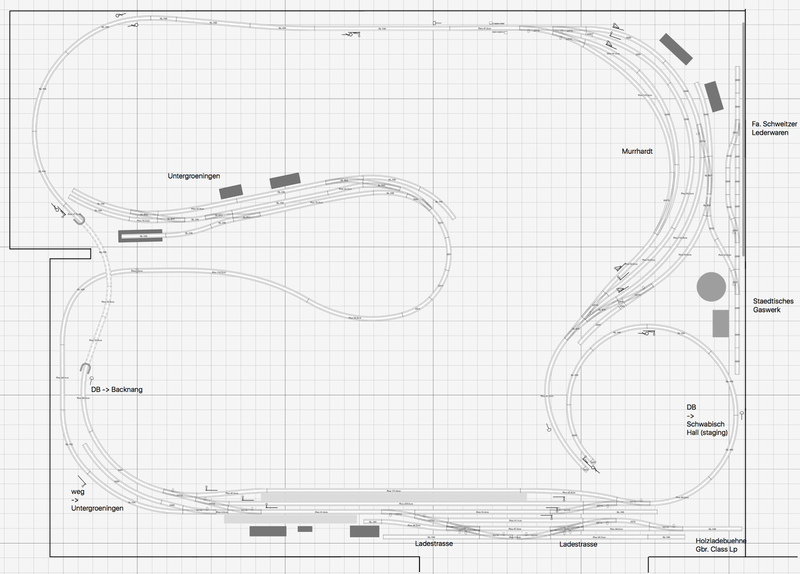 I realize more and more how hard it is to create prototype-oriented track plans with the space normal model railroaders have, and this room is already a very generous space. Of course, I'm also trying to cram a lot of features into this layout. Three stations (Gaildorf West, Murrhardt, and Backnang), plus staging under the lower level, and I still want some distance between stations. At various points I have also considered including Sulzbach, Fichtenberg, or Backnang-Spinnerei, for operational variety.